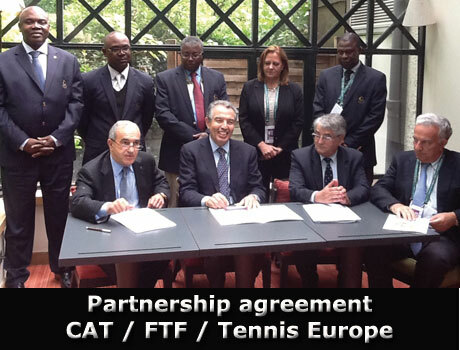 The Confederation of African Tennis (CAT), the French Tennis Federation (FFT) and Tennis Europe (TE) represented by their Presidents Tarak Chérif, Jean Gachassin and Jacques Dupré, and in presence of Francesco Ricci Bitti ITF President had signed in Paris on 4th June 2014 a cooperation agreement of which main objective consists to encourage the development of Tennis in Africa and in Europe, through the human resources and the know-ledge & expertise of the FFT in many areas such as training coaches, staff trainers, managers and officials & umpires. The FFT will help its counterparts in the implementation of partnerships with French training centers, in order to host trainings for players (boys and girls) selected by CAT. The FFT will also provide CAT with its know-ledge regarding the construction and the maintenance of clay court tennis courts. The signature of this agreement which took place at the Roland Garros Stadium had been also marked by the attendence of the five CAT Vice Presidents: Mrs Israa El Sanhoury, Mr. Mohamed Oumar Traoré, Mr. Samuel Minko Mindong, Mr. Patrick Gichira and Mr. Nelson Amanze, the CAT General Manager, Mr. Hichem Riani, a big number of Presidents of African National Federations that were present at Roland Garros as well as several French and international press bodies and medias.